I don’t care. I don’t care who you are. I don’t care why you’re here. I don’t care about Heaven or Hell or anything. I don’t even care that Lucifer’s got a bun in the oven. Ramiel was a Prince of Hell, one of the oldest of the old demons, created by Lucifer himself after the creation of Lilith and before the sinking of Atlantis. Created to lead the demonic army against the forces of Heaven, at some point in time Ramiel and his siblings Asmodeus and Dagon abdicated their rank in Hell and took to living quiet lives on Earth with the demon hierarchy spreading the rumor that the Princes of Hell were all killed off to keep anyone from searching for them. Ramiel has bright yellow irises with white sclerae and without visible pupils. Wally notes signs of his presence include the disappearances of virgins (which Dean attributes to his lust), and -- like his brother Azazel -- cattle mutilations. Unlike Azazel, he lost interest in freeing Lucifer, calling Azazel a "fanatic" for his devotion. 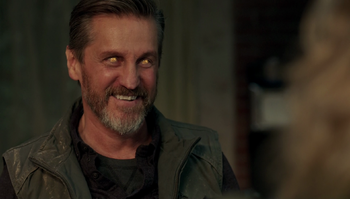 He preferred to be left alone to a quiet life and even turned down Crowley's offer to rule Hell, though he remained a sadistic and destructive force even in retirement. Crowley went to Ramiel with his offer first and Ramiel spoke on the behalf of his siblings Asmodeus and Dagon, which may indicate that he was seen as the leader of the three surviving Princes of Hell. Ramiel is knowledgeable in runework and is much stronger than angels such as Castiel and demons such as Crowley. Ramiel is a collector, having amassed a large collection of ancient and arcane weaponry. Most notable among his collection are the Lance of Michael and the Colt. During his time on Earth, Ramiel also grew fond of night fishing. Wally made note that Ramiel normally adheres to a very tight schedule and routine. Invulnerable to devil's trap bullets, Ruby's knife, and angel blades. After Lucifer's defeat, Crowley and an unnamed demon appear in Ramiel's home bearing gifts for the Prince of Hell. As a tribute from all of demon kind, Crowley first offers him the Lance of Michael, which impresses Ramiel. Next, Crowley gives him a personal gift -- the Colt, much to Ramiel's astonishment. Crowley tells him it is his "coronation present" which confuses Ramiel. Crowley goes on to tell him that Hell is in need of leadership, with Lilith and Azazel dead and Lucifer locked away once more. Ramiel is not interested, instead he encourages Crowley to take the throne, promising him that neither he nor his siblings will interfere with him because they stopped caring a long time ago. Crowley graciously accepts, under Ramiel's one condition: no one or thing must ever come looking for a Prince of Hell again, lest Crowley wishes to witness the wrath of them first hand. Ramiel, having gone night fishing, returns to his home early to find the Winchesters waiting inside. Unfazed, he simply asks them what they are doing in his house. He kicks up the rug in front of him, revealing a devil's trap, and has a laugh as he realizes they are hunters. Dean fires devil's trap bullets repeatedly into his chest which have no effect on Ramiel as he advances on Dean. Sam moves up behind and stabs him in the side with the demon-killing knife. Ramiel elbows Sam, knocking him into the wall. Dean watches, shocked, as an unfazed Ramiel pulls out the knife and examines it. As Mary and Castiel enter the room, Ramiel takes notice of Castiel immediately, sneering at him before he drives Castiel into the kitchen and throws him against the cupboards. 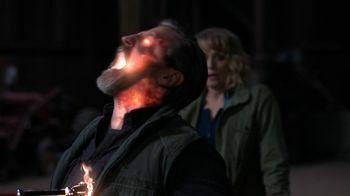 Sam and Dean try to join the fight, but he uses demon powers to shut the door in their faces, leaving him face to face with Mary at gunpoint. Mary is shocked when Ramiel's eyes flash yellow, and he knocks her gun away. Castiel tackles Ramiel and orders Mary to run. As Mary runs out the backdoor, Castiel is flung through the window to the outside. Injured Castiel begins crawling away, as Ramiel casually walks outside. He remarks that it has been a long time since he has seen an angel as he pulls the Lance of Michael out of thin air from behind his back and drives it into Castiel's side. As Castiel continues his escape, Ramiel laughs and continues stalking him. As Ramiel prepares to deliver another blow, he is run down by Mary in a jeep and sent flying down the road. Ramiel in the throes of death after being stabbed with the Lance of Michael. Later, as Ramiel walks down the road to the abandoned barn the Winchesters and the dying Castiel have been holing up in, Crowley appears before Ramiel to try and dissuade him from killing the Winchesters. This confuses Ramiel. When Crowley attempts to make a new deal with him, Ramiel simply sends Crowley flying through the barn door, knocking him unconscious. As Ramiel strolls into the barn, Sam lights the lighter and drops it, igniting a holy fire ring around Ramiel. Sam and Dean pace the perimeter of the ring, questioning him how they can cure Castiel. Ramiel simply tells them there is no cure. When Dean begins posturing, asking if Ramiel knows who they are, Ramiel simply replies he doesn't care about anything, who they are, why they are there, Heaven, Hell, etc... The only thing he wants is to be left alone, and for them to return what they have taken from him. He takes out his pocket watch and gives the Winchesters thirty seconds to give him back what was taken. When the thirty seconds is up, Ramiel reaches behind himself to pull the Lance of Michael out of thin air once again. He raises it and slams it to the ground, extinguishing the holy fire and throwing Mary, Sam, and Dean backward. Sam charges him, but Ramiel fights him off with the lance. Dean then charges him and is also thrown off. Mary tries next, and then Sam returns using an angel blade to counter the lance. Dean picks up a shovel and attacks. Ramiel is closing on Dean with the lance raised to stab him, when Sam comes at him from the side, wresting the lance from Ramiel while Mary stabs him in the back with an angel blade, distracting him long enough for Sam to spear him with the lance. Ramiel laughs and then explodes into a cloud of black dust. Ramiel is the name of a fallen Watcher angel in the Book of Enoch. He is described as the sixth leader of the 200 fallen angels. While the Book of Enoch is consider apocryphal text, Ramiel does appear in the Bible proper. He is described as the angel of hope, delivering visions and guiding the faithful to Heaven. This page was last edited on 9 October 2018, at 00:09.